TSV and Victoria Police recently conducted a bus compliance activity targeting buses transporting seasonal workers to farms in the Robinvale area. The two-day activity resulted in 22 buses inspected. Five buses were found to be fitted with fire extinguishers not in test, one bus was issued with a defect notice for frayed seat belts, and two bus services were being operated without bus operator registration. TSV officers also conducted compliance activities at school bus interchanges in Swan Hill and Bendigo. The activity included checking the operation of the school bus warning lights. In total 42 buses were inspected. The officers found three drivers were not carrying their driver licence, and one driver was not carrying his driver accreditation. 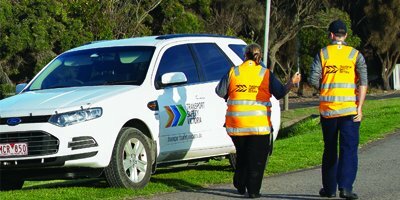 TSV officers will be conducting further compliance inspections at school bus interchanges throughout Victoria. At times they will be accompanied with officers from either VicRoads, Taxi Services Commission or Victoria Police. Drivers who are found not carrying their licence or accreditation may be issued with infringement notices.